Behind glass walls Written on July 13, 2010, by Ingeborg. How to extend a museum housed in a traditional villa? Bureau SLA bought the neighbouring villa and built 4 bridges in between. The bridges are the largest window shopping windows in the Netherlands. 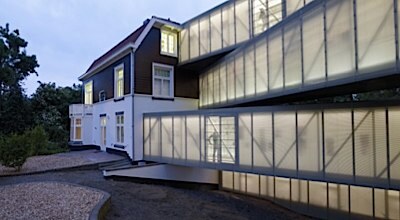 The glass boxes inside, showing the glass of the National Glas Museum, are built by Piet Hein Eek. Other big names are on show behind the glass: Arnout Visser, Scholten & Baijings.